Francis Danby. Plaster Bust, by Christopher Moore; in National Gallery of Ireland. Was a younger son of James Danby, a small landed proprietor, of St. John's near Killinick, Co. Wexford, by his second wife Margaret Watson of Dublin, and was born on the 16th November, 1793. In 1798, owing to the disturbed state of the country, James Danby removed with his family to the town of Wexford and in 1799 settled in Dublin. In his will, made in Wexford on 20th May, 1799, he says: "Having lately escaped assassination and being convinced of the savage disposition of the majority of the people, am more than ever reminded of the uncertainty of life," etc. The will was proved on 20th November, 1807. His property in Wexford being settled upon the children of his first wife Susanna, daughter of the Rev. Ambrose Harvey, of Hermitage, Co. Wexford, viz., John Henry, James, and Mrs. Jane Boyd, he left his second wife and her family but slenderly provided for. By her he had two sons, twins, Thomas, who died in childhood, Francis, and a daughter Frances Olivia. Francis studied in the Dublin Society's Schools and on the death of his father he determined to adopt art as his profession. He had made the acquaintance of George Petrie and James Arthur O'Connor and he continued his studies under the latter. In 1813 he exhibited some pictures and drawings, chiefly landscape compositions, at the Society of Artists in Hawkins Street, and one of them, "An Evening Landscape," he sold to Archdeacon Hill for fifteen guineas. With this money he went to London, accompanied by his friends Petrie and O'Connor. Their small means were soon exhausted; Petrie returned to Dublin, and Danby and O'Connor set out on foot for Bristol hoping to make their way thence to Ireland. 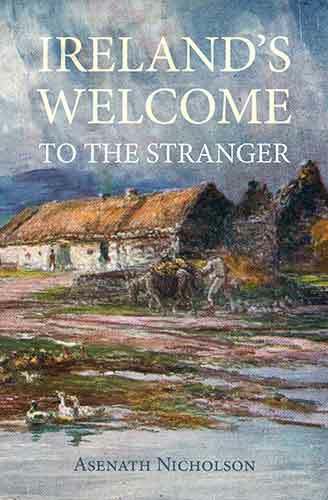 On their arrival they had not sufficient to pay for their night's lodging, and Danby raised the necessary means by selling two of his sketches of the Wicklow Mountains. O'Connor returned to Dublin, but Danby remained in Bristol, where he was fortunate enough to find employment for his brush through the patronage of a wealthy citizen named Fry. He remained in Bristol until 1824, paying occasional visits to Scotland and even to Norway. He made his first appearance as an exhibitor in 1820, sending a large picture, "The Upas or Poison Tree in the Island of Java," to the British Institution, and in the next year sent "Disappointed Love," to the Royal Academy, which was followed in 1822 by "Clearing up after a Storm," and in 1823 by "A Landscape with Warriors in the shade of a Mountain Glen listening to the song of their Minstrel." While in Bristol Danby had made a hasty and imprudent marriage which was destined to have unfortunate effects upon his future career. He took up his residence in London in 1824, and established his reputation by his fine picture, "Sunset at Sea after a Storm," which was purchased by Sir Thomas Lawrence. This was followed next year by "The Delivery of Israel out of Egypt," painted in the style of Martin. In the same year he had his "Enchanted Island" at the British Institution, and was elected an Associate of the Royal Academy. Other important works followed, including "The Opening of the Sixth Seal," bought by Beckford and now in the National Gallery of Ireland, and "A Moonlight Scene from the Mount of Olives," now in the Soane Museum, both exhibited in 1828. The road to fame now seemed open to him; but events occurred which disastrously affected his career, prevented his attaining full membership of the Academy and compelled him to leave England. What the circumstances were is now forgotten: "A story ill to tell," says Redgrave, "with faults and no doubt recriminations which the grave has partly closed over." "An unhappy marriage and its concomitants shivered his household gods,'' says another writer quoted by Redgrave. All might in time have been forgotten; but his rupture with the Academy and separation from his brother artists was perpetuated by himself. "There was evidently some obliquity of moral sense in Danby's mind in regard to this affair; since, when the older members were passing away and younger men arising who would willingly have forgotten the past, and, as a man of true genius, sought to have him of their body, Danby was not one to let his faults slide out of memory, but was rather in the mood to justify and excuse himself and to attribute his neglect to every possible cause but the right one." Danby left England for the Continent in 1829, and for the next ten years he lived chiefly in Switzerland, spending his time yachting and boat-building on the lake of Geneva, and supporting himself by the sale of his drawings and occasional commissions for pictures. He once appealed to the Royal Academy for pecuniary assistance and was granted the sum of fifty pounds. He was possessed of considerable mechanical genius, and the year of his death he had taken out a patent for a new form of ship's anchor. In 1837 he was staying in Paris at 8 Rue Vanneau with his old friend J. A. O'Connor, (q.v.). He returned to England in 1841 and sent his "Sculptor's Triumph" and two other works to the Royal Academy; and from that year he continued as a regular exhibitor, sending pictures which were characterized by all his early power and poetic imagination. The merit of his work entitled him to his promotion to Membership of the Academy; but his claims were overlooked, and the refusal to do him this honour embittered his life. In 1847 he left London and took up his residence at Shell House, Exmouth, where he remained until his death. Among the best works of his later period were "The Fisherman's Home" (R.A., 1846); "The Grave of the Excommunicated" (B.I., 1846); "The Evening Gun" (R.A., 1848); "Spring" (R.A., 1850) and "A Wild Seashore" (R.A., 1853). He contributed drawings to the shortlived "Pictorial Times," started by Henry Vizitelly in 1843, and made a few contributions to the Royal Hibernian Academy. He died at his residence at Exmouth on 9th February, 1861, after a short illness. His last picture, "A Dewy Morning," had left his easel only a few days previously. Thus closed a life sad in its failures and disappointments, how far merited we cannot now tell; a life clouded by the imputations cast upon him which, helped by his own perverseness, barred his way to the honours and rewards of his profession. But he was a man of many good qualities, warm in his attachments—he kept up a life-long friendship with the companion of his youth, George Petrie—and kind and helpful to young artists. In his works Danby shows wonderful imagination and poetic feeling, though his pictures are often laboured in execution and have a certain monotony; when not dark and gloomy, the golden sunrise or the red glow of sunset are predominant features. His striving after particular effects in his idealized landscapes is often fantastic, and fails to impress the imagination. His pictures have not stood well; their glassy surface tends to render them obscure, and they have much darkened with age. His "Opening of the Sixth Seal," in the National Gallery of Ireland, and his "Upas Tree," at South Kensington, must be now very different from the pictures so much praised and admired when fresh from his easel, and in a few years will be hardly visible. His "Painter's Holiday," in the Fitzwilliam Museum, is now an utter wreck. Danby exhibited forty-eight pictures at the Royal Academy between 1821 and 1860; and seventeen at the British Institution between 1820 and 1852. 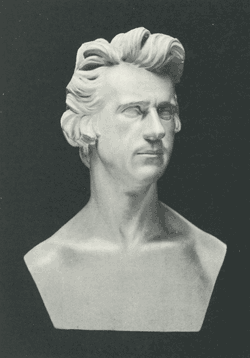 A bust of him, in plaster, by Christopher Moore, done in 1827, is in the National Gallery of Ireland. The Upas Tree. [Victoria and Albert Museum.] B.I., 1820. Disappointed Love. [Victoria and Albert Museum.] R.A., 1821. Clearing up after a Shower. R.A., 1822. Landscape, with Warriors of old times in England retired to the shade of a Mountain glen to hear the song of their Minstrel. R.A., 1823. Sunset at Sea after a Storm. R.A., 1824. Bought by Sir Thomas Lawrence; sold at his sale in 1830 for £107. Engraved by Finden in "Royal Gallery of British Art." The Delivery of Israel out of Egypt (also called Pharaoh and his Host overwhelmed in the Red Sea). R.A., 1825. Duke of Sutherland's collection, Trentham, sold at Christie's in 1908. Engraved in mezzotint by G. H. Phillips, 1855. An Enchanted Island. B.I., 1825. Collection of John Gibbons of 16 Hanover Terrace, Regent's Park, sold at Christie's, 29th November, 1912. An engraving by G. H. Phillips purporting to be from this picture was from a small composition done by a pupil. Christ walking on the Sea, R.A., 1826. Solitude, sunset, the moon rising over a deserted city. B.I., 1826. Collection of John Gibbons of 16 Hanover Terrace, Regent's Park, sold at Christie's, 29th November, 1912. The Embarkation of Cleopatra on the Cydnus when she first met Mark Antony in Cilicia. R.A., 1827. Engraved by E. Goodall. Collection of John Gibbons, 16 Hanover Terrace, Regent's Park, Christie's, 29th November, 1912. The Merchant of Venice; scene, Belmont in the Garden of Portia's House. [Soane Museum.] R.A., 1828. An Attempt to illustrate the Opening of the Sixth Seal. [ National Gallery of Ireland.] R.A., 1828; Art Treasures Exhibition, Manchester, 1857, by Francis Edwards. While on exhibition at Rochdale in 1843 a piece was cut out by a visitor, but was recovered and replaced. J. Griffith's collection, Christie's, 1871, bought for National Gallery of Ireland for £96 15s. Engraved in mezzotint by G. H. Phillips. Subject from Revelations—"And the fourth Angel sounded, and the third part of the sea was smitten," etc. R.A., 1829. Subject from Revelations—"And the Angel which I saw stand upon the sea and upon the earth lifted up his hand to heaven," etc. R.A., 1829. Moon Rising over a Wild Mountainous Country. B.I., 1829. The Golden Age. R.A., 1831. Sold at Foster's, London, June, 1855, for 325 guineas. "Rich and Rare were the Gems she wore." R.A., 1837. The Sculptor's Triumph when his Statue of Venus is about to be placed in her Temple—a Morning at Rhodes. R.A., 1841. Liensfiord Lake in Norway, a Sudden Storm. [Victoria and Albert Museum.] R.A., 1841. The Enchanted Castle—Sunset. R.A., 1841. Mary Magdalen in the Desert. R.A., 1842. A Contest of the Lyre and the Pipe in the Vale of Tempe. R.A., 1842; B.I., 1843. A woodcut in "Art Journal," 1855. Scene in the Vale of Tempe. B.I., 1852. A Soirée at St. Cloud in the reign of Louis XIV. R.A., 1842. The Holy Family reposing during the Flight into Egypt. R.A., 1842. The Last Moment of Sunset. R.A., 1843. The Painter's Holiday. [Fitzwilliam Museum, Cambridge.] R.A., 1844. Calypso's Grotto. B.I., 1844; R.H.A., 1844. The Tomb of Christ after the Resurrection. R.A., 1844; R.H.A., 1845. The Wood Nymph's Hymn to the rising Sun. R.A., 1845. Sold at Lord Northwick's sale in 1856, for £378, to Mr. Eckford. Sunset after a Storm, a sailor on a raft. Christie's, 1845. The Gate of the Harem. [Royal Collection.] B.I., 1845. Purchased by Queen Victoria. Engraved in "Art Journal," 1857, by J. T. Wilmore. Landscape, with Rasselas and Imlac, etc. R.A., 1846. Sunrise, the Fisherman's Home. [National Gallery of British Art, Vernon Collection.] The view was sketched on the banks of a river in Norway. R.A., 1846. Engraved in "Art Journal," 1852, by A. Willmore. The Dawn of Morn. R.A., 1846. The Tempest. B.I., 1846; R.H.A., 1846; Cork, 1852. The Grave of the Excommunicated. B.I., 1846; R.H.A., 1846. Purchased from the artist by Mrs. Gibbons of Hanover Terrace, Regent's Park; sold at her sale May, 1883, for 22 guineas; Christie's, 29th November, 1912, collection of Miss M. Gibbons. Blackberry Pickers; a Lane in Devonshire. R.A., 1847. A Seaman's Farewell. R.A., 1847. The Lover's Walk. B.I., 1847. Caius Marius in the Ruins of Carthage. R.A., 1848. The Evening Gun, a calm on the shore of England. R.A., 1848. Collection of John Gibbons, 16 Hanover Terrace, Regent's Park, sold at Christie's, 29th November, 1912. A Calm after a heavy Gale off Beechy Head. B.I., 1848. Landscape, twilight, with the rising Moon, B.I., 1848. Death and the Old Man. B.I., 1848. Morning on the Banks of Zurich Lake, with Pilgrims embarking on their way to Einsettlin. R.A., 1849. Sold at Lord C. Townshend's sale in 1854, for £693. A Mountain Chieftain's Funeral. B.I., 1849. A Golden Moment. B.I., 1850. Winter—Sunset. R.A., 1851. Painted in 1850 for Mrs. Gibbons; sold at her sale, May, 1883, for 80 guineas. A Ship on Fire. R.A., 1851. Collection of John Gibbons, 16 Hanover Terrace, Regent's Park, Christie's, 29th November, 1912. A Summer Sunset—Home ! Home ! R.A., 1851. A Wild Seashore at Sunset. R.A., 1853. The Departure of Ulysses from Ithaca. R.A., 1854. A Party of Pleasure on the Lake of Wallenstadt, Switzerland. R.A., 1855. Christie's, 1st June, 1872, collection of James Bagnell of West Bromwich. Evening, "in the rosy time of the year." R.A., 1855. Dead Calm—sunset in the Bight of Exmouth. R.A., 1855. The Court, Palace and Gardens of Alcinous. R.A., 1857. A Smuggler's Cave. R.A., 1858. The Death of Abel. R.A., 1858. Landscape—Ulysses at the Court of Alcinous. R.A., 1858. A Lake Scene—Going to the Fair. R.A., 1859. Phoebus rising from the Sea. R.A., 1860. Ulysses and Nausicaa. Christie's, James Dorrington's sale, May, 1880. The Falls of the Conway. Christie's, April, 1879. Lake Leman. Sam Mendel sale, April, 1875, 152 guineas. Still there is Hope. Christie's, 1861, £236. The Wanderings of Orpheus. Oval, 34 by 26 inches, Foster's, 1860. The Crucifixion. Hibbert Collection, Christie's, 1860, £21. A Dewy Morning. Painted in 1861; the artist's last work. E. Bullock sale, May, 1870, £105. The Procession of Krishna. Drawing. Collection of John Gibbons, 16 Hanover Terrace, Christie's, 29th November, 1912.